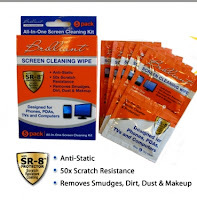 I really hate smudges on my computer screen, so I was happy to try the Brilliant Screen Cleaning Wipes with SR-8 . Brilliant screen cleaning wipe with SR-8 provides gentle, superior cleaning to electronic screens and removes dust, dirt, finger prints and makeup while imparting an invisible, durable barrier that protects screens 50 times more from scratching. Helps protect against re-soiling to keep your screen brilliantly clean! Cleans and protects monitors, electronics, eyeware and more! Brilliant Screen Cleaning WipesTM with SR-8TM provides gentle superior cleaning while imparting an invisible durable barrier that resists scratches, soiling and water spots. SR-8 is a Polymer Additive that reduces surface tension making cleaning easier each time it is used. Since I get really upset with anyone who dares to touch my screen, the main problem I have is that it gets really dusty - and usually I don't notice until I open it when I'm away from home. That dust really shows up when the computer is turned off and the screen is black! These screen cleaner wipes are going to be really handy for that, because they come in handy little packs I can just tuck into my computer case. Also, they come with a wet wipe and a dry cloth - so you can clean the screen with the wet one and then dry it right away. Screen cleaners that I've tried before were always just the wet cloths, so you had to hope the screen didn't streak when it dried or just wait until the cloth dried and then use it. I cleaned both my laptop screen, which was really dusty, and Jeffrey's laptop screen, which was dusty and had smudges all over it with one set. It worked really well, and I know I'm going to be happy to carry these with me. I'm also looking forward to seeing how long the clean lasts. It's been a few days, and my screen is still looking really good. I'm hoping that anti-static property keeps that dust away for a good long time! You can try these Brilliant Screen Cleaner Wipes for yourself. You must do BOTH to enter, but each will count as a separate entry. You haven't done Camera Critters or Looking at the Sky on Friday recently, I kinda miss those! Okay, I "Like"ed them on fb, and left a comment. Oh, yeah, I followed them on the Twitter too. Oh, and I tweeted about your giveaway too. I don't know how to find a link to an individual tweet, but since I'm pretty sure that you are following me still anyway, you'll see it. I'm pretty curious how long the clean will last too. How is your screen so far? I always get dusty screens and I usually use that cloth used to clean eye glasses, but it doesn't do a perfect job and the dust just keeps coming back! If your clean lasts pretty long then I'm gonna get me one of those. Also is it effective for cleaning mirrors too? I liked them on facebook and left a comment.